At a recent workshop in the UK, I introduced a method to get the most out of one's Yang Lu-ch'an form training by using the scapula in the yin/yang method. Learning Tai Chi is not a simple matter of learning some movements or postures and putting it all together! As one progresses, we learn more advanced methods of practice in order to get the most out of the little time that we have for training. If one learns the way that we should learn, it is not all that complicated. However, if people see the more advanced methods, not even knowing the correct beginner's method, then it can seem daunting. 'Sung' is one of the most valuable and important aspects of learning tai chi. However, 'sung' is difficult to gain if we have learnt our Tai chi form by simply looking at what the hands and feet are doing and then trying to emulate that. What we should be doing is to see what the whole body is doing as a whole. But this is difficult for the beginner. You will never gain 'sung' if you try to make the hands go into sung by concentrating upon them. And it is the hands that will first go into sung. Sung means, something like; 'moving without feeling'. So if we are able to cause the arms and hands to move by using some other part of the body, then we will understand sung quicker and therefore be able to gain the higher levels of the art quicker and also gain the great healing and martial benefits that we are always told about in the classics. You can never gain what it says in the classics from doing basic forms! The scapular control what the arms do. So if we are able to use the scapular in a manner that causes the hands and arms to move, then 'sung' and yin and yang are only a short distance away. However, it is not an easy matter to get the scapular working as it requires some amount of muscle isolation. You must be able to move your scapular independently of each other. In other words you must be able to stick one scapular out while the other one is not and visa-versa and you must also have to stick both of them out at the same time. Photo No. 1 shows the left scapular sticking out while Photo No. 2 shows the right. And Photo No. 3 shows both. In this position, the arms are locked in and the scapular work kind of like a motor car leaf spring. The arms can be pushed down slightly but spring straight back up again automatically thus giving great power in the arms and hands. The scapular are closer to our centre and as such we can use them to gain 'sung' in the hands because the scapular will move the hands independently of what we are thinking about. So there is no thought in the movement! And isn't that what we are all trying to achieve in our normal form training. In fa-jing punching, we use the scapular and in fact cannot even perform fa-jing without the scapular being used in the above manner. When the right arm for instance is loaded ready to attack, the right scapular is pushed right out ready to push in thus forcing the fist out with great power when necessary. The scapular movement is also responsible for those attacks that we call 'reverse' or pulling attacks as in the first major movement in the Old Yang Style when we move both arms over to our left as in Photo No. 4. The application for this movement is as in Photo No. 5 when the left palm will strike his oncoming attack while the right palm will also push over to your left to attack to his GB 3 (temple) point. 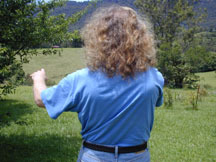 The scapular in this first attacking movement from the form works like this: As your left palm moves out to your right and then begins to come over to your left, the left scapular is forced out. Photo No. 6. As your right palm takes over the attacking duty, the left scapular goes in while the right scapular is forced out thus giving great power to the attack. Photo No. 7. This is pure yin and yang in every movement and this happens all the way through the form with each posture having a yin and a yang part. So each posture in the form has a left then a right scapular movement or a right then a left scapular movement. Learning tai chi and doing your tai chi form in this manner you will discover what exactly Taijiquan is all about and your hands will simply move by themselves without any thought at all! I have a new video title covering this information plus much more taking you up to the posture known as 'Press' or 'Arn'. (Grasping Swallow's Tail). See the video section for this.